The woman behind Tom Foolery is Shannon Ashford, who is the founder, designer & creator of these innovative pieces of clothing. Because I'm so inspired by entrepreneurial women who put sustainability and ethics at the forefront of their businesses, I asked Shannon a few questions. 1. Why did you start Tom Foolery? The idea for Tom Foolery started after the sixtieth time I heard a woman in the restroom complaining about peeing in a jumpsuit. Someone had to address this issue! It started as just a simple problem-solving garment but while in the process of creating the company I realized I had much loftier goals in mind. The largest being to completely change the fashion industry by implementing a transparent supply chain, using recycled and sustainable material, and creating a product that is actually benefitting the lives of others through well-paid jobs. It’s going to be a long process but we hope to inspire others along the way to be more conscious of where their clothes are coming from and who they are impacting with each purchase. 2. Why did you choose to get your fabrics from Thread? I wanted to be using recycled material for my jumpsuits so I started the way anyone does- on Google. After days of researching different processes of turning bottles into fabric and contacting about thirty different suppliers, Thread was the first to respond. They were so enthusiastic about working together! It was like finally finding the right hairdresser. I felt completely home with the wonderful people at Thread and am incredibly grateful for their support and community over the last six months. 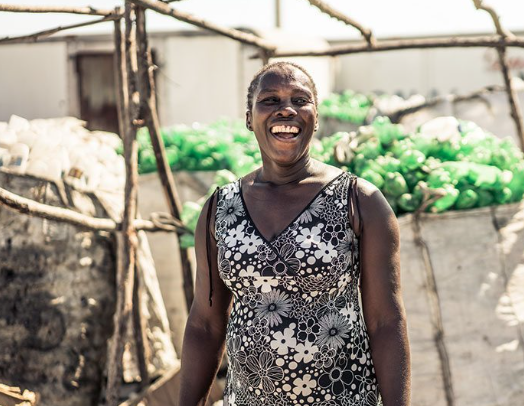 Nadine Phillipe, a collection center owner in Cite Soleil, Haiti. Bottles ready to be recycled. 4. What makes you feel the most confident/empowered? A kickass jumpsuit, clean hair, and a longboard. 5. Why do you think people should invest in ethical clothing? I think investing in ethical clothing is investing in humanity. There is so much darkness in the fashion industry that is so well hidden. Taking the time to find ethical brands means that with every purchase you are cleaning up our planet, paying someone what they’ve truly earned, supporting other families, and gradually making this world a better place. Shannon and I have teamed up to giveaway one of her hand painted palm tree t-shirts. You can head over to Maine Ethics on Instagram for more details on how to enter.